In my 26 years in the business, the price discount available to someone who is willing to commute has never been greater. As shown in the 6 maps below created by our consulting team, this discount occurs throughout the country. Fewer drivers. 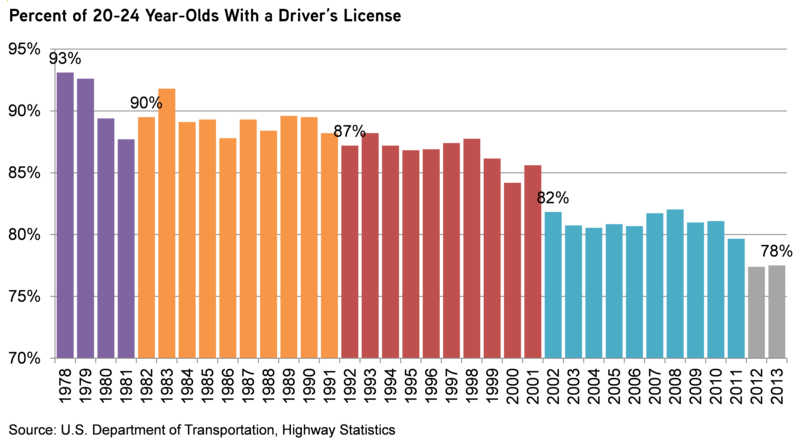 Only 78% of 20–24 year olds today drive, compared to 93% in 1978. While I don’t have the stats for older buyers, suffice it to say that more households are opting not to own a car, and Uber will likely exacerbate this trend. More telecommuters. 26% of workers aged 26–45 report that they telecommute, which is 5% more than those aged 46–55 and 10% more than those aged 56–65. The Internet has clearly enabled more knowledge workers to live wherever they want, as evidenced in our own company by great employees who live in Green Bay, Utica, and Portsmouth. So why aren’t more people opting for affordable housing on the fringes? Price appreciation. Will the discounts associated with being further from the job centers return to normal, resulting in far more price appreciation in these outlying areas, or has there been a permanent shift where homes in the outlying areas will be valued at a greater than historical discount—or is the answer somewhere in between? Construction volumes. This lack of “commuter demand” is one major reason why new home construction remains low, as most of the available developable land is on the urban fringes. If a permanent shift in relative value between cities has occurred, how big are the negative implications for new home construction volumes? Homeownership. What are the implications for homeownership, as housing close to job centers remains quite expensive? From 1900 through 1945, the era before highway construction opened up the suburbs, US homeownership was 45%+/-. We should note that mortgage qualification was also far more difficult prior to 1945. There is an old industry saying that home buyers get in their car and drive until they can find the home they want in their price range. $1,000 in savings per mile used to be an industry rule of thumb. This “drive until you qualify” discount far exceeds the industry rule of thumb today. To show this, our consulting team calculated the values in various cities in comparison to their prior peak values. 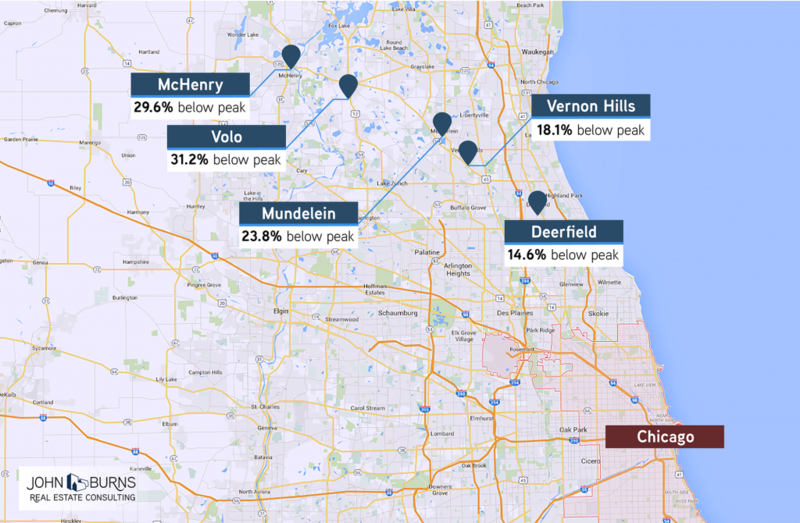 Along Chicago’s I-294 corridor, consultant Lance Ramella calculates that values in Deerfield have recovered to within 15% of prior peak pricing, with much less recovery all the way out to McHenry, where homes are priced 30% below peak. The same is true along Chicago’s I-88 corridor, where Naperville has recovered to within 6% of peak pricing, yet more distant Aurora remains 34% below peak. 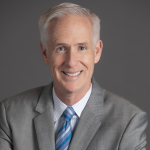 In Los Angeles, where the entire county average is 11% below peak pricing, consultant Pete Reeb calculates Glendale has recovered to within 2% of peak, Santa Clarita has recovered to within 14%, and Palmdale remains 37% below peak. Pete notes that similar ratios ring true throughout the Southland, where Carlsbad in San Diego County now exceeds prior peak by 2%, but Vista remains 11% below peak, and Ramona remains 22% below. In the Inland Empire, which feeds off Los Angeles, homes in Fontana remain 28% below peak, while distant Victorville remains 43% below peak. 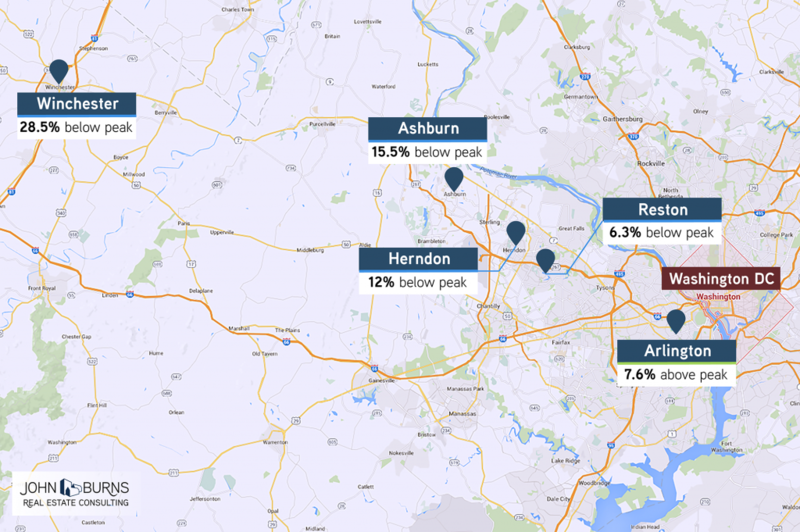 In the Washington, DC suburbs, consultant Dan Fulton calculates that homes in Arlington are 8% above prior peak, while Reston is 6% below peak, Ashburn is 16% below peak, and distant Winchester remains a whopping 29% below peak. 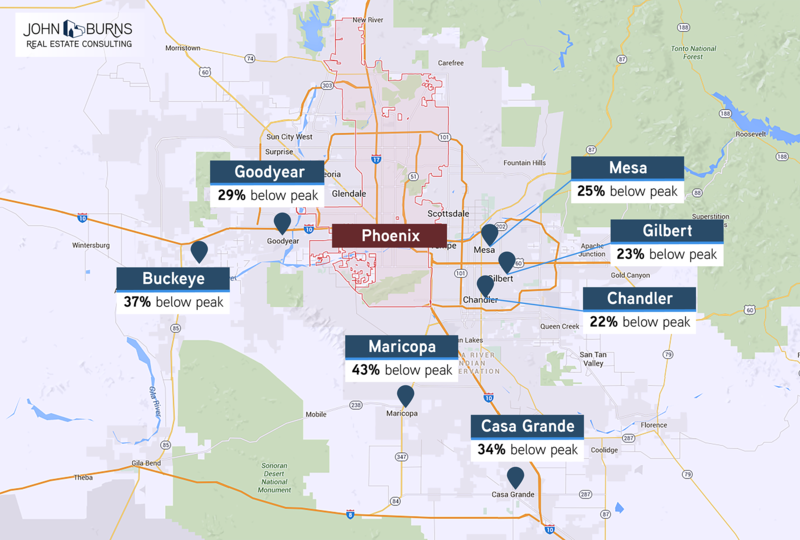 In Phoenix, Ken Perlman notes that Chandler is 22% below peak, while more distant Casa Grande is still 34% below peak, and the City of Maricopa remains 43% below peak. 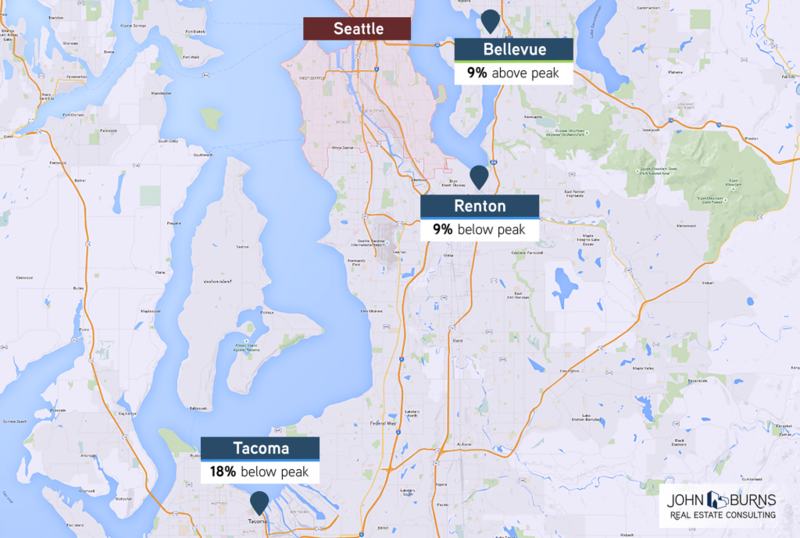 In Seattle, Ken notes that homes in Bellevue now exceed the prior peak by 9%, while homes in more distant Renton remain 9% below peak, and homes in even more distant Tacoma remain 18% below peak. Even in traditional retirement areas, the distant communities have appreciated less. Consultant Lesley Deutch notes that home prices are still 16% below peak in Naples, but they are 29% below peak in Bonita Springs and 41% below peak in North Fort Myers. Phoenix and Chicago are also great examples of markets where certain corridors or sides of town have recovered far more than others. Phoenix’s West Valley recovery lags greatly. Chicago’s I-88 Corridor has outperformed. Consultant David Kalosis notes that in Atlanta the drive until you qualify phenomenon really starts from North Atlanta’s Golden Triangle and then fans out in all directions, with lot and home prices decreasing in proportion to school performance and overall desirability as you move outward from these key submarkets. While our research has shown that the outlying areas usually correct more in a downturn and take longer to recover, and while we also believe that a growing percentage of people prefer to live urban for many reasons, affordability still matters. Because of the very large price discount to relocate to outlying areas, we expect more price appreciation in outlying areas than in better locations, to varying degrees and with some exceptions that are too big to list in an email. If you are a business leader and have a specific inquiry, feel free to contact one of our 31 consulting team members about your project. Methodology note: We used Zillow.com to calculate the values shown above, showing cities where we agree that Zillow’s estimate approximates the correct premium or discount from peak we have observed.